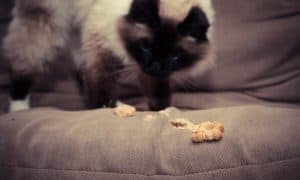 Does your cat mow through his food as quickly as possible – sometimes so quickly that his food comes right back up? The phenomena is known as “Scarf and Barf” and it’s as unpleasant (and unhealthy) for cats as it is for cat owners. All of these things need to be first addressed by a veterinarian, but once any health issues have been resolved, you need to address the behavior itself. 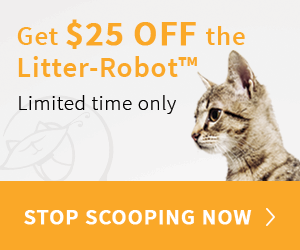 Fortunately, there are plenty of ways to help your cat be a little less obsessed with food. 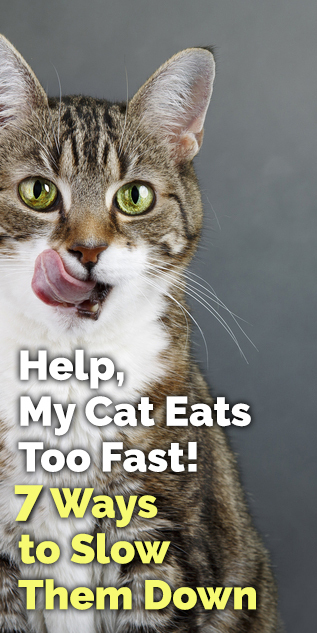 The first – and most effective way – to slow your cat’s eating down is to tap into their instinctual need to hunt. There are many products that can help you do this, but we’re in LOVE with Doc and Phoebe’s Indoor Hunting Feeder. 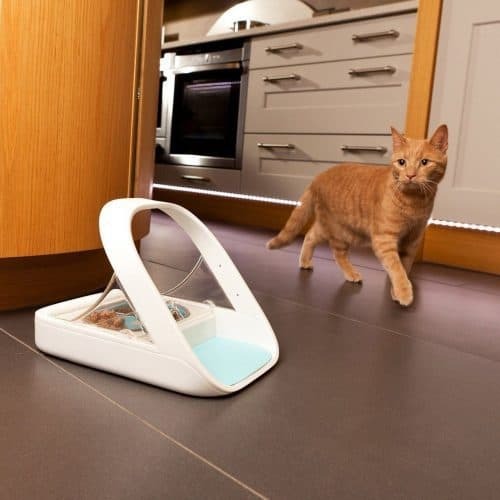 This system uses small hollow mouse-shaped containers that you fill with your cat’s dry food and then hide the mice around the house. When your cat is hungry, he has to go hunt for his food. It’s a simple but ingenious way to slow your cat down and help him find some fulfillment in his bowl. Other products that fulfill your cat’s instinctual need to hunt are treat balls – that you can actually fill up with your cat’s kibble – like the SlimCat by PetSafe. Cats are predators, but there is a certain amount of foraging that goes along with being a hunter. 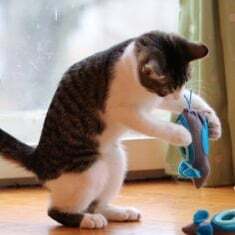 Using puzzles like the Digger from Catit stimulate a cat into solving a puzzle for food helps slow down their feeding while engaging their mind. Our intelligent cats want to work for their food! Your smarty cat may also enjoy solving puzzles for treats. Try these by Nina Ottoson. Start with an easy-to-solve puzzle and your cat will figure it out and work up to the more challenging puzzles in no time! 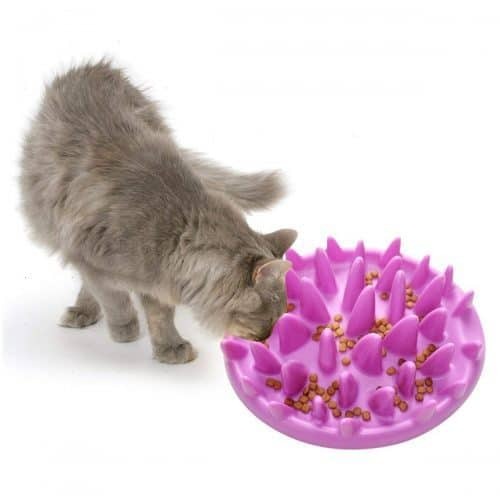 There are several feeding mats available for cats that help them both hunt and forage their food. Snuffle Mats are usually marketed for dogs, but it’s really an easy way to slow down your cat as he must rummage through the mat to find his kibble. Technology definitely has its place when it comes to slowing down a cat’s eating. Sometimes a cat eats fast because he’s bullied by other animals or he feels insecure while eating. An automated feeder, like the Sureflap Surefeed bowl, only opens the feeding bowl for a specific cat thanks to radio frequency technology! The bowl senses when the correct cat is near the bowl and closes it back up when he moves away from it. 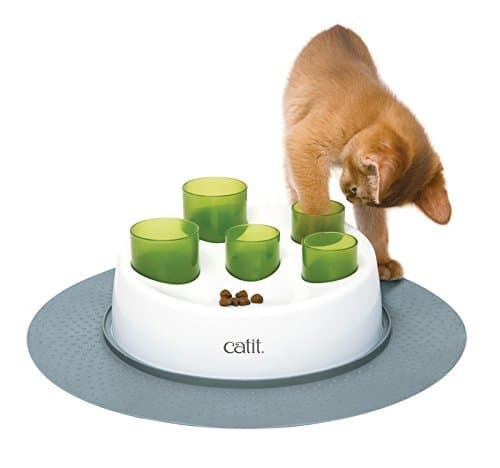 This not only slows your cat’s eating, it stops other cats or dogs from accessing their food. 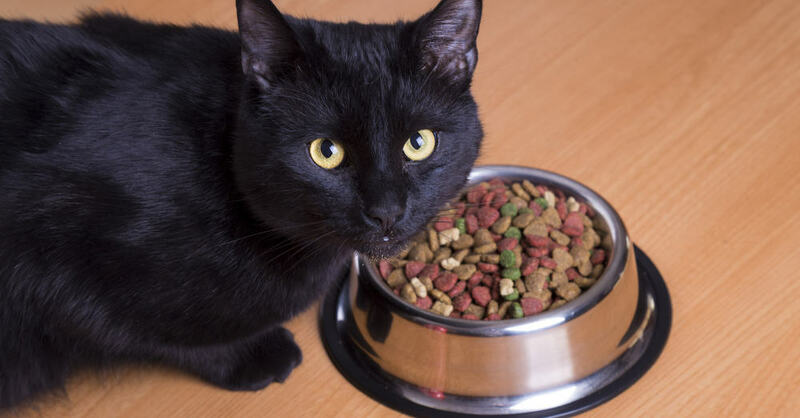 No one likes to see a cat scarf down their food and, while the reasons for doing so range from medical conditions to simple boredom, it’s important to show your cat that there is another – slower and safer – way to eat. 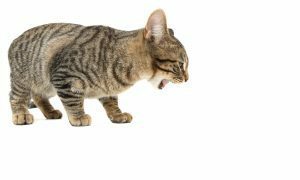 Ask the Vet: Is it Normal For Cats to Throw Up After They Eat?